“Synchronizing folders” simply means that Outlook 2007 is sending and receiving email and RSS messages, updating Internet-based calendars, and other tasks that require communication with other computers on the Internet. Many users complain that Outlook 2007 takes far too long and uses far too many resources for this task. But synchronization is not an “option,” it’s an essential feature. You can’t turn it off permanently or you won’t have any email, RSS feeds, etc. You might as well uninstall Outlook, a solution quite a few people choose in favor of Mozilla Thunderbird or another email client, including an earlier version of Outlook. 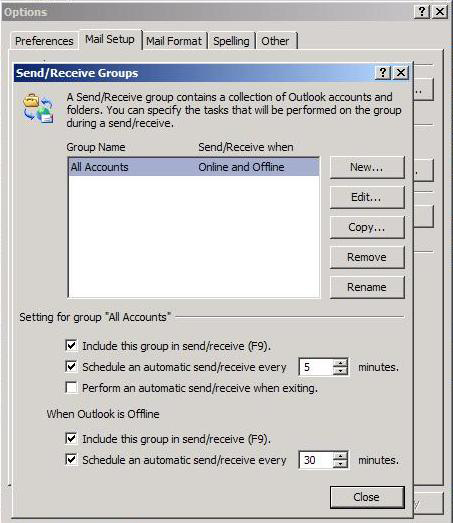 You can uncheck the “automatic send/receive” box and Outlook 2007 will synchronize folders only when you manually click the Send/Receive button on the main menu bar. Some antivirus software ties itself intimately into Outlook to monitor incoming and outgoing mail for viruses in attached files. Often, this causes synchronization problems. Disable mail scanning in your antivirus software. If an email account is misconfigured or corrupted in Outlook, or if your email service provider is temporarily down, this can cause excessive synchronization activity. Check the Send/Receive Progress dialog box for any error messages in individual email accounts. Try deleting a faulty account and re-creating it. You may have to wait for your mail provider to fix a problem on its end. This can’t be all there is to it, can it? May send and recieve runs every 10 minutes and takes seconds, whereas “Synchronizing Folders” takes minutes and interupts everything else going on. I don’t want *&^^% rss feeds coming through my email or system. I just want my basic email. Open the Microsoft Outlook 2007 program on your computer. Click the “Tools” option from the top toolbar menu and then click the “Account Settings” option. Select the Exchange server account that your Outlook 2007 application is connected with and then click the “Change” button. Click the box next to the “Cached Exchange Mode” field so it’s deselected below the “Microsoft Exchange Server” section. Click the “Next” button and then click the “OK” button. Click the “Finish” button to close the dialog box. 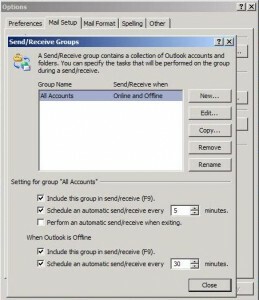 In Outlook 2007 at least, if you click on the downward arrow next to Send and Receive, at the bottom of that menu is Send/Receive Settings, then ‘Define send and receive groups’ (the form displayed in this article). Click on the group, click Edit, click on the account you don’t want to synch and untick ‘Include the selected account in this group’ and click OK.